Hari Kondabolu has made a name for himself in recent years as a sharp, outrageously observant, indie, activist comedian. He's made the rounds on the night shows, has his own half-hour special on Comedy Central and paired up with Kamau Bell for the wildly popular Politically Reactive podcast (helping us all survive in the age of Trump). He's the internet's hilarious, versatile, woke brown boyfriend. 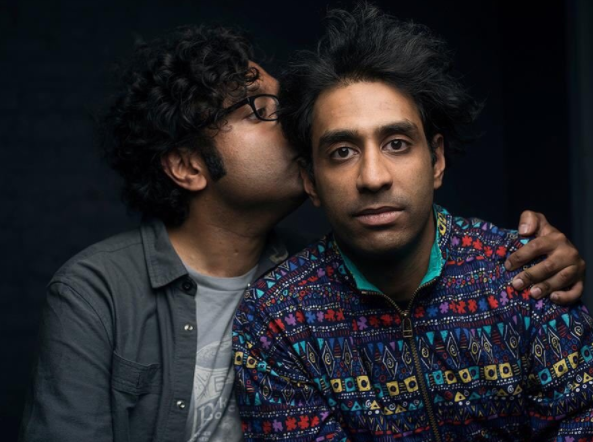 Now, Hari's hitting the US circuit with his little brother Ashok (“Dapwell” of the now-defunct rap-group Das Racist) for what they're calling The Untitled Kondabolu Brothers Project. They're making their way across the US with Salt Lake City, Phoenix, Denver and the East Coast stops coming up. "The Legendary Kondabolu Brothers of Queens (Hari and Ashok) were born to immigrant parents attempting to create Indian-American superhumans and instead were left with a comedian (Hari) and a man of indefinable abilities (Ashok). They have combined forces to create a semi-regular live talk show called “The Untitled Kondabolu Brothers Project” and a new podcast “The Untitled Kondabolu Brothers Podcast.” They are one day hoping to make money. Watch the brothers share unbelievably shocking family secrets. Watch them get into heated conversations about religion, gentrification, Nazis, racism, and baseball. Watch Ashok drink 2 liters of tea in an hour without urinating once. Watch them infuriate each other with their patented brand of spontaneous and incisive fraternal psycho-analysis. Watch them go off on tangents with widely varying levels of success. Anything is possible during this freewheeling, mind-melting performance." More on Hari at harikondabolu.com or on Twitter at @harikondabolu. And find Ashok on dapwell.com and on Twitter at @dapwell.